Lalit Sodha, D.C. graduated from the Canadian Memorial Chiropractic College, Toronto, Canada in 1990. With 25 years of clinical experience in private practice, he has had the opportunity to work with different chiropractors and treat patients with a variety of conditions. 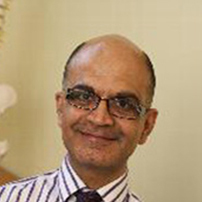 He manages the practice at Eastcote with a very well-trained team of chiropractors and support staff. Lalit Sodha, D.C. had the privilege of working at the prestigious Hale Clinic, Regents Park, London W1, for five years with a team of very specialised complimentary care practitioners. His keen interest lies in helping patients get better and teaching them how to keep well. He also qualified with the Spine Research Institute of San Diego in the Masters Program in Whiplash Injuries (1994), hence has a keen interest in treating patients with whiplash injuries. Lalit Sodha, D.C. also prepares medical-legal reports for insurance companies and their patients. Lalit Sodha, D.C. uses the Diversified Technique and treats all areas of the spine and the joints of the body. He also uses the Activator Method. He lectures on the spine and how to maintain a healthy spine.